Another promotional drinking cup included in a promotion with the main objective of raising sales and retaining existing customers. If your main core competency is in selling beverages, then this promotional product is definitely for you. This is something that will definitely make your brand stand out more than your competitors. Take a look at it. Another promotional drinking cup in store – Does it actually work and how we can make it more exclusive? With one glance these cups look just like a normal cup, but take a closer look and you will see that the lid is actually a clock that can stand on its own. This is an innovative idea that can drive sales for your business. It is suitable for a gift with purchase promotion, where people will buy more just to get your promotional gift. 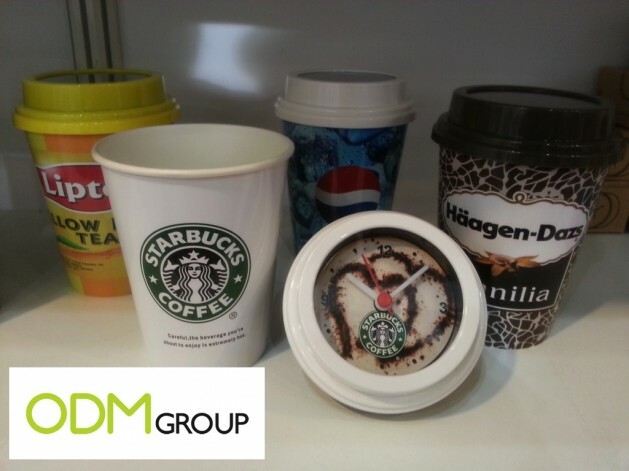 You can also brand the cup, to increase brand awareness. Just check out the Starbucks logo that make the cup has a higher perceived value. Same goes with the Lipton, Pepsi and Häagen-Dazs. These cups look like the products they are selling. A promotional drinking cup is easy to customize and print our branding onto it as it has a big space and thus as a result will have a great exposure to the public. We need people to see our brand to encourage them to choose us and not the competition! You can always contact Mindsparkz, to help you look into other options and concepts to be able to differentiate yourself from competition. Looking for more promotional ideas? These links will definitely help you.